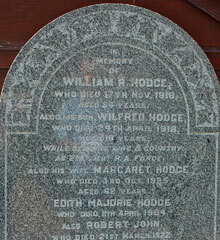 Wilfred Hodge was a son of William Robert and Margaret Hodge. Wilfred was born on 16th July 1898 in Tyrone. The 1911 census records Wilfred as a 12 year old schoolboy. The family lived at Cabragh, Clananeese, Tyrone. Wilfred attended Dungannon Royal and was Captain of the school rugby team. He also played for Ulster in 1917-1918. His father was a farmer and merchant. 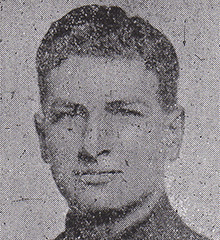 Second Lieutenant Wilfred Hodge was with the 99th Squadron of the Royal Air Force when he died from gastric ulcers in Eastern Hospital, Cambridge on 24 April 1918. St. Paul's Killeeshil Church Of Ireland Churchyard lies midway between Dungannon and Ballygawley. There are 2 Commonwealth burials of the 1914-1918 war here. 3 War Graves Photographic Project Photo of Wilfred Hodge's headstone can be purchased here.